New as a theoretical concept, social innovation has a long tradition in practice. It evolved as a bottom-up movement in various areas of society and it takes place across public, private and non-profit sectors. While social innovation begins to be broadly embraced by policy-makers and scholars in the context of healthcare and education, hardly any research has been done in the fields of the arts and culture (Mulgan et al., 2007). This paper aims at exploring what social innovation means, how to foster this type of innovation, and the possible links between social innovation and the arts. The authors will address those issues via the case study of the Waag Society in Amsterdam, The Netherlands. Waag Society is an institute for art, science and technology, which explicitly develops creative technology for social innovation. It can be considered a pioneer in integrating social innovation into its projects, even before the concept became in vogue. Founded in 1994 as an institute for old and new media, Waag has ever since been developing projects that combined art, science and technology for social improvement. The aim of this study is exploratory. The case study of the Waag Society has been qualitatively analyzed via online and offline published materials and semi-structured interviews with six of its employees. Social innovation knows a relatively short history in the theoretical realm. Mulgan (2006) argues that this concept “has received little attention and rarely goes beyond anecdotes and vague generalizations” (p.146). When it comes to defining social innovation there seems to be agreement as to the fact that it addresses major challenges in society – healthcare, poverty and the environment as the most frequently mentioned ones. Social innovation is “a novel solution to a social problem that is more effective, efficient, sustainable, or just than existing solutions and for which the value created accrues primarily to society as a whole rather than private individuals.” (Phills Jr. et al., 2008, p.36). Phills Jr. et al. (2008) are clear in stating that “a social innovation can be a product, a process, a technology but it can also be a principle, an idea, a piece of legislation, a social movement, an intervention, or some combination of them. Indeed, many of the best recognized social innovations, such as microfinance, are combinations of a number of these elements” (p.39). The same characteristics of the concept are reiterated by Murray et al. 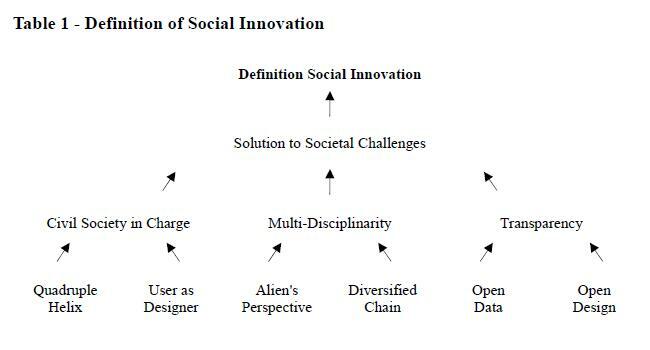 (2010) who define social innovations as “innovations that are social both in their ends and in their means” (p.3). In conclusion, “an innovation is truly social only if the balance is tilted toward social value – benefits to the public or to society as a whole – rather than private value – gains for entrepreneurs, investors, and ordinary (not disadvantaged) consumers” (Phills Jr. et al., 2008, p.39). Since social challenges and problems require complex solutions, these can only be found if different individuals and organizations across sectors, disciplines and fields cooperate (Phills Jr. et al., 2008; Murray et al., 2010). A social innovation, therefore, is a something new that addresses social needs by creating novel networks or collaborations. Following the definitions developed by Murray et al. (2010), the European Commission’s DG Enterprise and Industry states that social innovations “are innovations that are not only good for society but also enhance society’s capacity to act. Social innovations take place across boundaries between the public sector, the private sector, the third sector and the household”(1). While absent in the European policy discourse of several years ago, social innovation has been integrated in the Europe 2020 strategy for its potential to combine the three pillars “smart, sustainable and inclusive growth”(2). New organizations, committees, platforms, projects, researches, initiatives and awards have popped up, making social innovation the new hype (e.g. the flagship initiative Innovation Union, the organization Social Innovation Exchange – SIX, the initiative Social Innovation Europe – SIE, the Theoretical, Empirical and Policy Foundations for Social Innovation in Europe – TEPSIE). Waag Society gave social innovation an important place in its activities right from its first year of existence in 1994, with the launch of the project De Digitale Stad (The Digital City), the first publicly accessible Internet platform in the Netherlands(3). In 2012, Waag Society together with Kennisland, another organization involved in social innovation, published the Manifesto: Invest in Social Innovation. According to the manifesto, social innovation responds to serious social challenges with new ideas, products, and strategies developed by networks of people and organizations from different sectors, fields and disciplines. “‘Horizontal’ innovation, in other words, with a myriad of actors” (Stikker and Sigaloff, 2012, p.1). Within Waag Society, various projects are developed corresponding to six specific themes or labs: Urban Reality Lab, Creative Care Lab, Open Design Lab, Creative Learning Lab, Open Wetlab and Future Internet Lab. The six interviewees are working in different labs or across labs and are involved in diverse projects as business developers, project managers, project developers, directors, heads or managers of a lab. The interviews took place in Amsterdam in April and May 2013 and were coded and analyzed using Nvivo 10. The interview questions can be roughly categorized into three groups: a) definition of social innovation; b) fostering social innovation; c) social innovation and the arts. 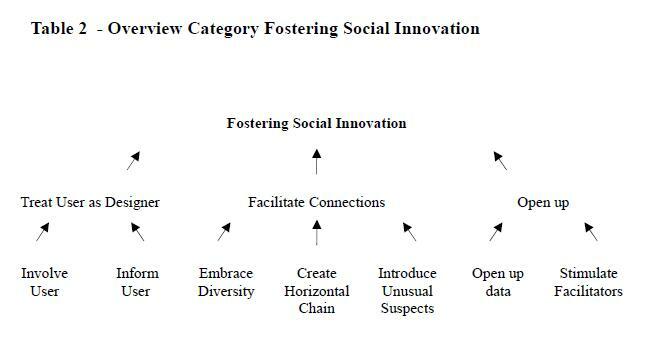 Despite the fact that four of the six interviewees found it difficult or not desirable to give a definition of social innovation, a coherent picture is drawn by their descriptions of key characteristics of the phenomenon. When coding the results of the interviews, Solution to Societal Challenges emerged as the aim of social innovation (Tab. 1). Five participants mentioned this aspect, implying that social innovation is the answer to societal challenges, be it changes, problems or questions. Interviewee 3 stated that social innovation is about “coming to a better society – or a different society”. The code Civil Society in Charge summarizes the importance of empowering people to, directly (Quadruple Helix) or indirectly (User as Designer), influence their own lives and circumstances. Quadruple Helix represents the development away from a triple helix – government, businesses and academia – toward a quadruple helix with civil society as the fourth sector (Arnkil et al., 2010). This is visible in bottom-up and small-scale organizations, but also in the increasing opportunities to make informed, free decisions. Interviewee 6 clearly defines that social innovation is about “the teamwork between citizens, governments, businesses, academic institutions”. The code User as Designer presents indirect empowerment of the civil society. Instead of thinking about consumer’s needs from “behind the desk”, as Interviewee 6 describes it, the target group is asked about its wishes right from the beginning of the development of a product or project. The publication Users as Designers describes this method as “Waag Society’s approach to social innovation” (van Dijk et al., 2011, p.3). Interviewee 3 explains that this process entails that one does not only look “at enterprises, science and government, but that you also involve the citizen. […] the citizen, the user, the consumer – I don’t mind how you call him – needs to be part of all design processes”. The code Multi-Disciplinarity summarizes the responses about the importance of different disciplines and perspectives that together lead to social innovation. The subordinated codes are Alien’s Perspective and Diversified Chain. Alien’s Perspectives can be described as the introduction of new perspectives that bring into existence unexpected solutions. Thanks to the outsider position with regard to knowledge about the usual affairs, an individual from one discipline entering another is able to solve problems more easily. The second code (Diversified Chain) means that a diverse chain of producers or innovators makes mutual inspiration and creativity possible. Moreover, it often entails the cooperation – and perspectives – of various organizations or sectors. “That means that our essence focuses on the fact that we work multi-disciplinary with artists, with visitors, developers and that this results in absolutely valuable, creative, crazy and playful applications that otherwise you’d not thought up” (Interviewee 2). Subsequently, solutions can be found that are complex enough to solve the big challenges of our times. The third and last code (Transparency) includes the codes Open Data and Open Design, which proved to be important features of social innovation. Open Data was frequently mentioned during the interviews for its potential to generate new knowledge and applications. Moreover, it is part of a broader movement away from a rather individualistic paradigm and towards one that is more grounded in reciprocity. The code Open Design implies openness about the production chain of a product, its features and the like. On the one hand it is literally enabling consumers to open up products (and therefore change or repair them). On the other hand it supports a more conscious, and therefore fair, attitude towards the conditions in which the products are made. Waag Society plays a major role in promoting social innovation in the Netherlands. Indeed, five of the six interviewees explicitly state that social innovation is the mission of Waag Society, integrated in all the programs. The category Fostering Social Innovation contains the codes Treat User as Designer, Facilitate Connections and Open Up (Tab. 2), which correspond to the codes in the previous part of the analysis (Civil Society in Charge, Multi-Disciplinarity and Transparency). The first subordinated code of Treat User as Designer (Involve User) points to the methodology highlighted above, namely “social innovation starts with the end user and it ends with the end user” (Interviewee 2). Another variant of Treat User as Designer is Inform User (direct empowerment). Talking about the project Low Cost Prosthesis, Interviewee 4 explains, “You, as a user, are completely dependent on the orthopedic specialist. So if something is wrong with your prosthesis, you need to go to the doctor or specialist immediately. And we think about it exactly the other way around”. Facilitate Connections describes the importance of creating networks with diverse partners, in order to stimulate social innovation. This code has three subordinated codes, namely Embrace Diversity (within the organization), Create Horizontal Chain (between organizations), and Introduce Unusual Suspects (individual and organization). Embrace Diversity creates fertile ground for flexibility and inspiration within the organization. “We are a very fluid organization. That is because we continuously get new input. You are always forward facing to the future, hardly ever looking back” (Interviewee 1). Through the combination of art, science and technology “we try to look whether you can make a difference in a number of different societal domains” (Interviewee 6). One commonly used strategy of Waag Society, here, is the competition format because “it is a way to bring people from very different backgrounds together” (Interviewee 1). Furthermore, it is important to let an outsider dive into the challenge or problem with a fresh perspective (Introduce Unusual Suspects). Often, this person is said to come from an artistic background, but this is not a necessity. Interviewee 6 explains that “if you have a problem in the financial sector, you don’t try to work on solutions only from the financial sector, but by bringing together different disciplines, which makes you come up with greatly other things. So do not only put the usual suspects around the table, but also the unusual people. To foster unusual cooperation’s, that is where the unexpected solutions come from”. Open Up consists of two subordinated codes, Open Up Data and Stimulate Facilitators. The former is slightly related to the code Inform Users since it is also about the empowerment of the civil society. However, the essential detail in Open Up Data is the way empowerment is offered, namely through sharing data. The reciprocity resulting from opening up databases, where everybody is allowed to work with, is highly important. Besides, policies, rules and platforms are supported and developed to foster social innovation practices (Stimulate Facilitators). In projects like the MuseumApp, Waag Society creates the possibility to “bundle the data supply of all the cultural parties in an open data platform” (Interviewee 1). The project Apps for Europe will create a thematic network to organize competitions for using open data from governments, science and culture. It will stimulate the winners to start business ventures and maximize the socio-economic impact and overall benefits of open data. Although hardly any academic text informs about social innovation and the arts, all six interviewees are convinced that this link exists. There are, nevertheless, differences in opinion as to how this relationship looks like. Most of the participants argue that the role of the autonomous artist is crucial to social innovation. As Interviewee 3 puts it, “The art for art’s sake principle, the Zwecklosigkeit [purposelessness] of art is a very important one. This autonomy remains important, because science is tied to its area of expertise with its own methodology, whereas an artist has a personal methodology. He is allowed to do research the way he wants to”. Artists’ free and more autonomous thinking leads towards new and innovative solutions. Thereby, artists give more meaningful and concrete shape to social innovation. Their aesthetic and communicative skills allow artists to address complex issues. Likewise, they provide people with “extraordinary experiences” (Interviewee 6), confront audiences and trigger new perspectives. “It is also essential that they do it with a love for forms that enables them to make things with a visual and communicative character, that can do much more than the diagrams that science uses” (Interviewee 3). This paper aimed at exploring what social innovation means, how to foster this type of innovation and the possible links between social innovation and the arts. Via the case study of the Waag Society in Amsterdam, The Netherlands, the authors have addressed these issues. Regarding the definition of social innovation, one can summarize the results by reiterating that social innovation aims at addressing societal challenges and that it stresses the importance of a) empowering people to influence their own lives and circumstances directly (Quadruple Helix) or indirectly (User as Designer), b) combining different disciplines and perspectives that together lead to social innovation (Alien’s Perspective and Diversified Chain), c) developing new knowledge via open platforms (Open Data) and dismantling the production chain and the features of a product (Open Design). When addressing the ways social innovation can be fostered, three main strategies emerged: a) Treat User as Designer entails involving the user in the entire process (Involve User) and empowering the user through information and knowledge (Inform User), b) creating networks within the organization and with diverse partners , so between organizations and individuals from different fields, sectors and disciplines (Facilitate Connections), and c) sharing open data and stimulating platforms as well as dialogues to advance social innovation practices (Open Up). So in conclusion, do the arts play a role in social innovation? The answer is definitely yes, but artists cannot address and solve social challenges on their owns. Besides, clearly not all of them want to do so. The case of Waag Society shows that social innovation occurs when not only artists, but people from diverse fields, disciplines and sectors (situated in businesses, knowledge institutions, governments and civil society) come together to address a social challenge and develop possible solutions hands-on. The artists that participate are an integral part of the process; one can argue, therefore, that the risk of instrumentalization becomes low. Consequently, it seems that we are far away from the highly criticized social impacts of the arts. Further research about artists’ motivation and experience within projects that deal with social innovation can delve more in depth into the topic. (1) Retrieved from http://ec.europa.eu/enterprise/policies/innovation/policy/social-innovation/competition/definition_en.htm [9 July 2013]. (2) Retrieved from http://ec.europa.eu/europe2020/index_en.htm 9 July 2013. (3) Retrieved from http://www.dds.nl [9 July 2013]. Arnkil, R., Järvensivu, A., Koski, P. and Pürainen, T. (2010). Working Paper Exploring Quadruple Helix – Outlining user-oriented innovation models. Retrieved from http://tampub.uta.fi/bitstream/handle/10024/65758/978-951-44-8209-0.pdf?sequence=1 [12 June 2013]. Stikker, M. and Sigaloff, C. (2012). Manifesto: Invest in Social Innovation. Retrieved from http://www.socialeinnovatie.net/en/ [12 June 2013]. Mulgan, G. (2006). The process of social innovation. Innovations: technology, governance, globalization, 1(2), 145-162. Mulgan, G., Tucker, S., Ali, R. and Sanders, B. (2007). Social innovation what it is, why it matters?and how it can be accelerated. Skoll Centre for Social Entrepreneurship. Retrieved from http://eureka.bodleian.ox.ac.uk/761/ [12 June 2013]. Murray R., Calulier-Grice, J. and Mulgan, G. (2010). The Open Book of Innovation. London: Nesta. Phills Jr., J. A., Deiglmeier, K. and Miller, D. T. (2008). Rediscovering Social Innovation. Stanford Social Innovation Review, 6(4), 34-43. Van Dijk, D., Kresin, F., Reitenbach, M., Rennen, E. and Wildevuur, S. (2011). Users as Designers. Amsterdam: Waag Society. Retrieved from http://waag.org/sites/waag/files/public/Publicaties/Users_as_Designers.pdf [12 June 2013]. Waag Society (2011). Samenvatting aanvraag Kunstenplan Amsterdam 2013-2016. Unpublished. Waag Society (2013). Jaarverslag 2012. Amsterdam: Waag Society. Retrieved from http://waag.org/sites/waag/files/public/Publicaties/jaarverslag2012.pdf [12 June 2013].